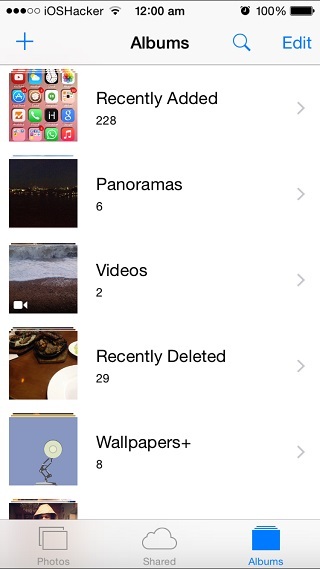 With iOS 8 came the super annoying ‘Recently Deleted’ folder in the Albums section of Photos app. This folder temporarily holds the images you have deleted from your device for a period of 1 month. After that period iOS automatically deletes them forever. During this time you can restore the images or manually re-delete them. While it can be handy in some situations when you want to restore a deleted image, it is mostly frustrating to find and then delete the images that you no longer need, twice. A new hack for Photos app called NoRecentlyDeleted fixes this anomaly by disabling the ‘Recently Deleted’ feature of iOS. This means the photos you delete from you library will directly be wiped from your iPhone, iPad or iPod touch without being saved in recently deleted album for any period of time. The tweak does not remove the recently deleted album and the photos you had deleted before downloading it will remain there. You can manually delete them from the folder if you like. NoRecentlyDeleted disables the feature which means the images you delete after installing it will not be saved in photos app. NoRecentlyDeleted is available in Cydia’s BigBoss repo for free. It requires iOS 8 and runs on all devices.